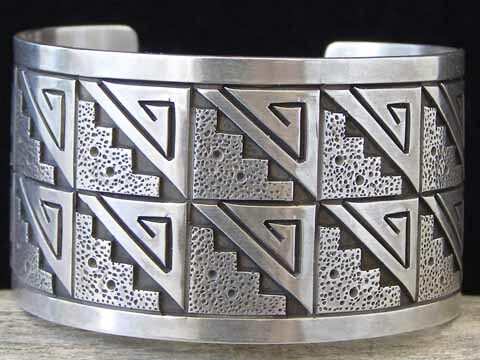 Herman Vandever Geometric Overlay Bracelet size 6 3/8"
Herman Vandever is a Navajo smith who comes from a family of well-known silversmiths. He is an expert at saw and file work and often makes ingot jewelry by melting his silver to roll it out into handmade sheet silver using a hand rolling mill. He makes both Traditional Revival jewelry and contemporary styles and always uses the finest natural stones, coral and shell to make his pieces. He sometimes makes gold jewelry as well. This is an overlay bracelet done in the style of Hopi overlay jewelry. A foundational layer of silver forms the base for this wide cuff which has an overlayer decorated by geometric cut-out designs. The decorated layer with cut-outs is soldered to the foundational layer. This makes for rich texture to the surface of the bracelet, while oxidizing the recesses of the cut-outs creates further contrast to the design. The motifs pictured by these geometrics represent kiva steps and blowing clouds. Exceptionally well crafted by a master smith. Signed HV in script inside the cuff.